This 8th of March, 800 women of different social movements occupied the printing plant of the newspaper in Rio de Janeiro. It belongs to the newsgroup “Globo Comunicação e Participações S.A”, which is the biggest in Latin America and in a monopoly position within Brazil. 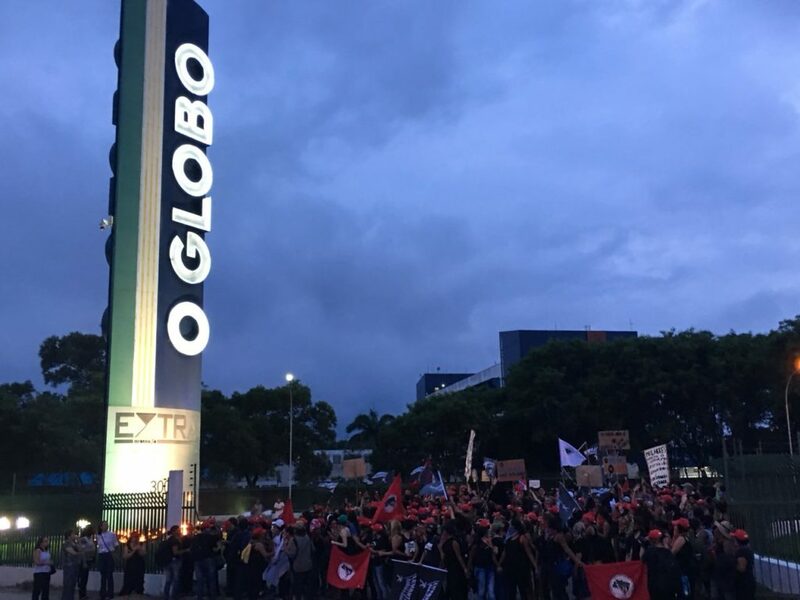 The activism started today at 5:30 in the morning in order to denunciate the decisive impact of that company on the instability of Brazilian politics and shed light on the complex interconnections of resent occurrences. The protests where organized by women from the Brazilian Landless Movement (Movimento dos Sem Terra; MST), the Peoples Youth Uprising (Levante Popular da Juventude), the Brazilian Movement of People Affected by Dams (Movimento dos Atingidos por Barragens, MAB) and the Brazilian Peasants Movement (Movimento dos Pequenos Agricultores, MPA) together with residents from the surrounding suburbs of Rio de Janeiro. The activists emphasize the crucial role of the company in the cold coup in Brazil, from the impeachment of president Dilma in 2016 till the ongoing prosecution of president Lula, in order to impede him as candidate in the upcoming democratic elections. Or, as Ana Carolina Silva from the Peoples Youth Uprising affirms: “’O Globo’ supports the coups in favor of its interests as company, it doesn’t care about the consequences for our country”. The MST leader states that the news company itself has economic interests involved in the pension reform. 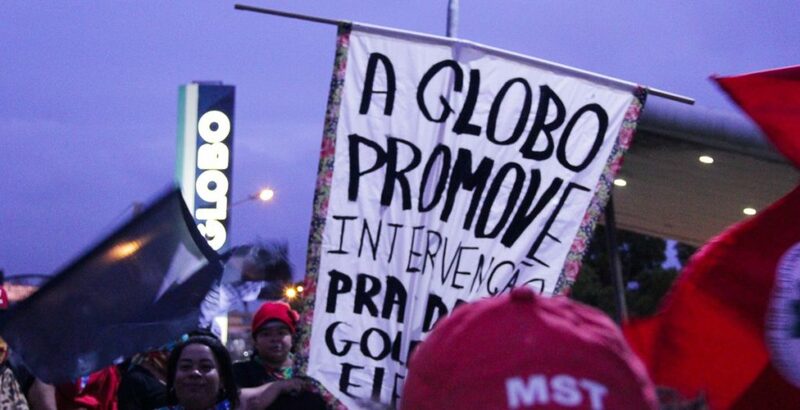 “’O Globo’ actively intervenes in politics in order to maximize his gains and its monopole on peoples minds. In this case, the pension reform affects directly ‘Mapfre Insurances’ (the biggest company providing private pension fonds) which belongs to the Globo Group Company.” Furthermore, the military intervention in Rio is a clear abuse of the army, she insists: “Military tanks and soldiers with machine guns do not resolve violence. The military should rather defend our sovereignty, including our natural resources, like petrol, water and our land, while Temer is handing them in a tray to the international capital”. The occupied printing plant is the biggest within Latin America. It was partly constructed by the public ‘Brazilian Development Bank’ (BNDES) with a net present value of 217 million $Real, and meant to print 800 thousand newspapers daily. However, in average, ‘O Globo’ didn’t print more than 130 thousand papers a day in 2017 (data by the Instituto Verificador de Circulação (IVC), an imparcial news supervision authority). So to say, it does not even use half of its productive capacity. “This place here is the unperceived elephant in the room on behalf of misinformation. While benefiting from so much public investments they should at least have the dignity to do some serious journalism. It is not for nothing that this newspaper is in decline. The workers of this country do not swallow anymore the lies and manipulations of the Globo Group Company”, Ana Paula Silva reaffirms.